The ITF Congress fringe event gave us the mandate to act collectively across the ITF on safe access to decent sanitation facilities, so let’s take our message to the wider world this World Toilet Day - by shining a spotlight on the problem, union action, and positive employer measures, towards the solution for transport workers. In India, MSTKS organised a workshop for the right for flush and voice that “to pee is the right of every worker”. Healthy & hygiene toilets are a fundamental right of workers. Considering these all, MSTKS gave a call for Sanitation for all on the eve of World toilet day. World Toilet Day Campaign observed by SRES/NFIR, India, including, ITF Women Transport Workers’ committee member, Simi Lal Singh. Women Committee members from three trade unions, Transport and Dockers, MBPT Docks & Gen Employees Union, and National Union of Seafarers of India, organized an event to mark World Toilet Day. Fifty women delegates from all the three Unions took part in the Mumbai event and shared the experiences they suffered in their respective workplaces ‘When Nature Calls’. Jack Sim (Founder of World Toilet Organisation) with Nishi Kapahi from ITF Delhi Office. ITF and the World Toilet Organization have a dialogue on the ITF 'Our Right to Flush' campaign for safe access to toilet facilities for all Transport workers! 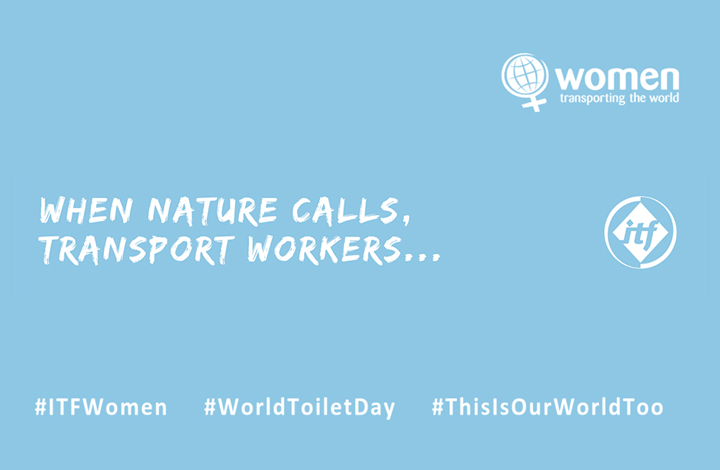 Nishi Kapahi spoke on how the issue particularly impacts on women transport workers globally, at the World Toilet Summit 2018, Mumbai, India. Unite the Union, UK - From left to right Adrian Jones (Unite National Officer Road Transport & Logistics and Vice-President of the ETF Road Section Unite National Officer), Diana Holland (Unite Assistant General Secretary - Transport Equalities and Food, and Chair of the ITF Women Transport Workers Committee), and Oliver Richardson (Unite National Officer for Civil Air Transport, Chair of ETF Civil Aviation section, and Vice-chair of ITF Civil Aviation section). At Unite Women’s Week, 100 women came together and called for dignity and respect, access to toilets and the right to flush! At Unite offices and in workplaces where they took photos and posted messages online. Unite also issued a press release covering all sectors, and related stories were featured on the BBC website, Huffington Post and many other newspapers. Unite interviews were shown widely on BBC TV and transmitted by various radio stations. NETWON Katmandu, Nepal – The day programme organised by Nepal Transport Labour Association (NETWON) included a written petition signed by Bro. Nur Nath Panta, General Secretary Nepal Transport Labour Association to Bro. Gyanendra Karki, Administrative Chief of the Kathmandu Metropolitan Police, for decent toilets for union members at every bus stop in Kathmandu. After receiving the petition, Bro. Gyanendra Karki said that he had asked the road department for 142 places among which, 42 places were available, and he assured NETWON that he will go to the Metropolitan office for the tender works in the week after, and thanked NETWON for alerting them on this important matter. Please use our templates to share your stories on social media.